PsycheDillic is a goat's milk cheese made from the highest quality milk and fragrant, hand-harvested rare dill pollen. The ingredients combine in this fresh cheese creating a surprising depth of flavor with a tart and bright finish taking your palate on a culinary adventure of intense aromas and distinctive flavor. 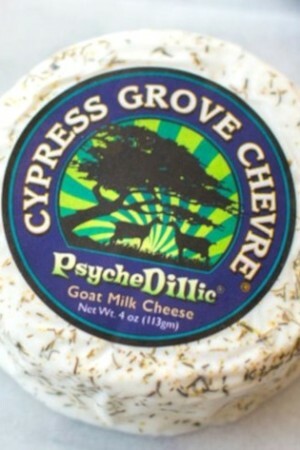 Cypress Grove Chevre is located in Humboldt County in the temperate Pacific Northwest coastal region of California. The origins of the business began during the 1970’s when the company’s founder, Mary Keehn, became interested in Alpine dairy goats while searching for a healthy source of milk for her young daughters. This resulted in the acquisition of two goats and from this small start, she quickly developed a passionate interest in breeding high quality Alpine goats. Within a few years, the size of Mary’s herd increased significantly and, finding herself with excess goat milk, she started experimenting with cheesemaking. By 1983 she officially founded Cypress Grove Chevre.